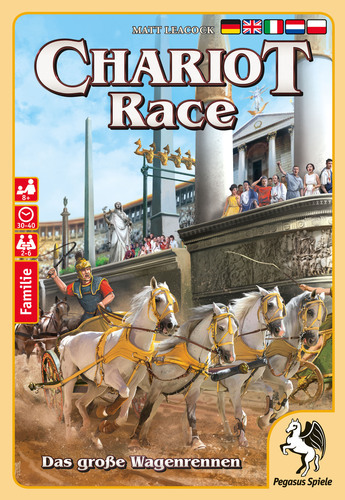 OK, so being the awesome boardgame journalist that I am, I actually had heard absolutely nothing about Chariot Race until I saw it on the Pegasus table at the Wednesday Press Event at the SPIEL fair this year. Sure, there are over 1,200 new games at the show, and it’s hard to know something about each of them – but man, this is from a well known designer with a track record of great games from a mainstream publisher. In any event, there was a good amount of buzz around the game, and when I had the opportunity to learn more about it, it wasn’t long before I had placed a request for a review copy as I was really excited to give it a try! In this game, players are chariot drivers, trying to win a two lap race around the track. Each player chooses a color and gets a matching player board. 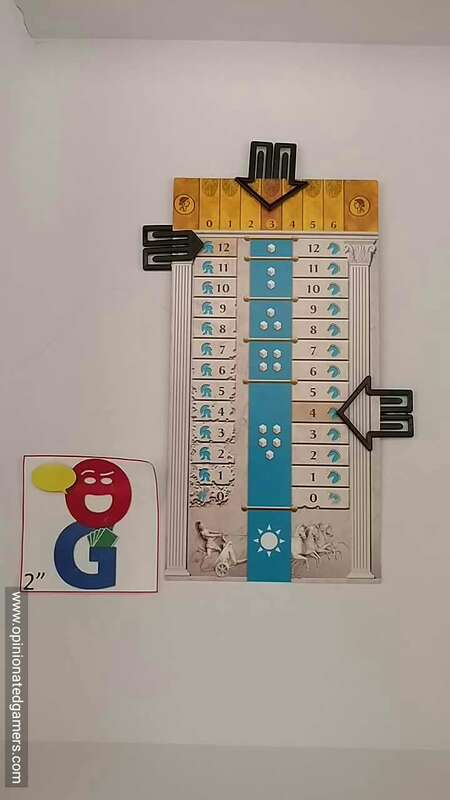 Paper clips are used to denote the starting values in Damage (12), Speed (4) and Fate (3). Starting order is randomly decided and the chariots are placed in the starting positions on the track. 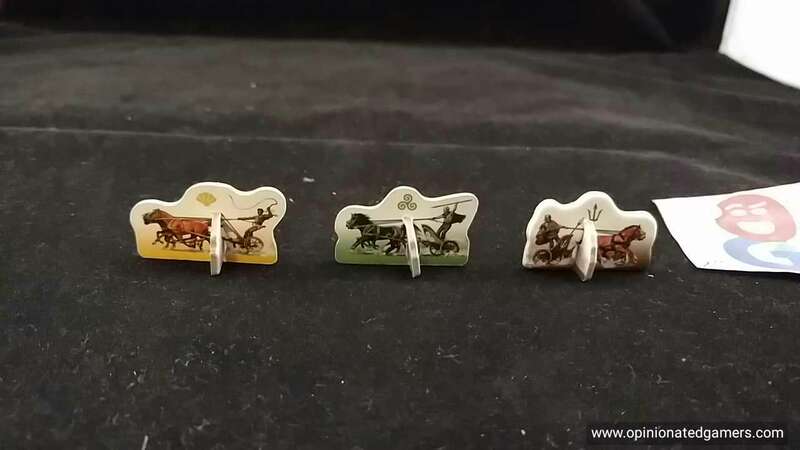 In each game round, each chariot gets one turn. Play order is determined by which chariot is further ahead on the track. There are six phases to each turn, and each player goes through all six phases before the next player goes. If, at the end of any turn, one or more chariots have completed two laps, the game ends. Otherwise, a new turn is begun. 2) Adjust Initial Speed – check your damage and speed tracks. In this phase, your Initial Speed may not exceed your current Damage value. If your Speed is higher, downgrade that track until it equals your current Damage value. 4) Obtain the Favor of Fortuna – For each Fortuna symbol rolled, gain one point on the Fate track. Note that you can never have more than 6 points of Fate. 5) Move – First you alter your speed based on the die rolls. The change speed face gives you the option of increasing or decreasing your speed by 1. The sprint face requires you to increase your speed by 2 as well as taking a mandatory one point of damage. Once you have applied all the changes, you must now move forward a number of spaces equal to your current speed value. If you have a change lane icon showing, you can expend it to change into the next adjacent lane. When you get to the corners, you’ll notice that each lane has a speed limit. If your current Speed rating exceeds the speed limit when you enter that space, you will take 1 point of damage for each Speed point that you exceed the limit. If you move through a space with another chariot, you Ram in, and both chariots take 2 points of Damage. If you still have movement points, you continue through the space to finish your movement. If your last point of movement is used to ram another chariot, you move into the first open space in the same lane as the ramming. If, at any point, a chariot has 0 on the Damage scale, it is destroyed and that player and chariot are eliminated from the game. A caltrop marker is left on the track where the destroyed chariot used to be to represent the debris. 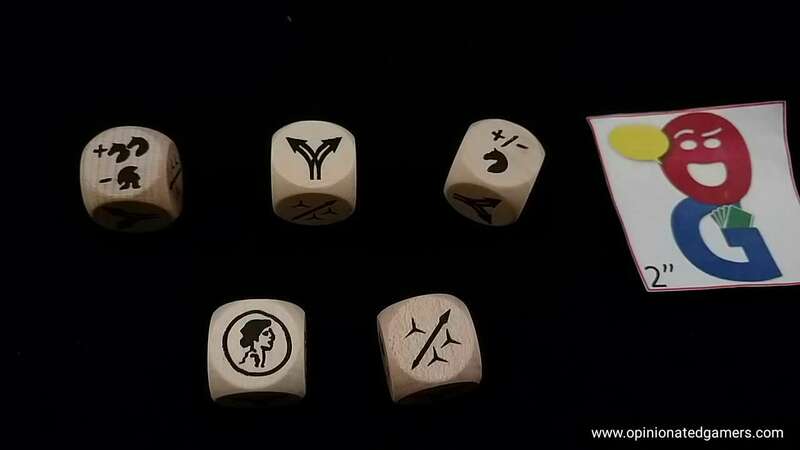 6) Attack – you may choose to attack – but only if you have rolled that attack face on your dice. Each one gives you the option of dropping a caltrop or throwing a javelin. You could drop a caltrop on any space that you have passed through this turn. Later in the game, if any chariot (including your own) goes thru that space, they take one point of damage, and the caltrop marker is removed from the board. You could also throw a javelin (after your movement is complete) at any chariot that is up to two spaces away in any direction. Your aim is so good that you automatically hit the target and cause one point of damage. Again, at the end of every round, check and see if any player has completed two laps. If not, start another round with the turn order being decided by the current order on the track. Note, that even if your chariot has crossed the line, it is still open to being rammed or hit by javelins. If it is destroyed before the end of the round, you do not win the game! Despite the fact that the game is designed by a major designer and put out by a major publisher, I had no idea that this game existed until I saw it on the floor of SPIEL. Sure, Pegasus hasn’t really had much promotional exposure over here as we’re really not their marketing focus, but with their recent appearance at GenCon 2016, I actually thought that I was on top of things with their releases. Chariot Race is a little game that doesn’t want to be easily categorized. 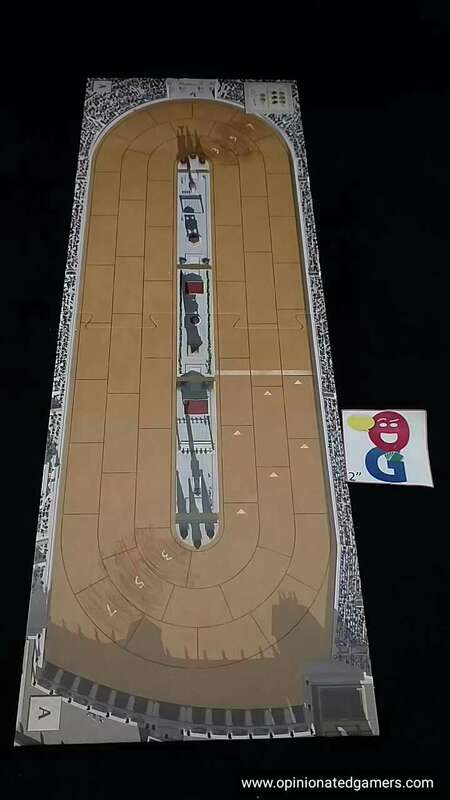 At first, it seems like a simple and fast racing game, but there is actually a fair amount of strategy and choice to a game which is only two laps around a small track. I thought that the game would be well suited for families, but the level of strategy is a bit more than what I would traditionally think of for a family game. Additionally, the targeted attacking and possible player elimination are traits not normally seen in games targeted for families. The game is advertised a quick – with a 30-40 minute range on the box, and in my games so far, I’d guesstimate that players are taking between 7 and 10 turns to get around twice – that is, assuming that they survive the game. Each individual turn doesn’t take too long – decide to heal or not, roll the dice, maybe twice, and then do a last minute calculation to see if you need to reroll/fix a die. The beginner track is wide open and gives you plenty of space for maneuvering – assuming that you roll the right number of change lane icons when you need them. The advanced side of the track has a smattering of rock fixtures that will take you out of the race if you hit them. This tends to force the chariots together at pinch points leading to lots of ramming and a target rich environment for your javelins. In my games thus far, Chariot Race has turned out to be less of a racing game and more of a battling, last-man-standing sort of game. In fact, in my two most recent games, the winner ended up being the only chariot left in one piece at the end (once actually having finished the second lap as well, once being just short of the finish). In our games, it seemed like healing wasn’t a great option as we simply didn’t roll enough Fate icons to give us points to heal – and as we were playing on the expert side – we often had to spend 2 points to get a lane change just to avoid instant disqualification. For my tastes, I would have liked there to be more emphasis on racing and finishing the game – and less about just surviving. It should be noted though that some of my competitors have loved the old-school (almost Ameritrashy) feel to the game. There has been a bit of griping online thus far at the component quality – the boards are admittedly not much more than coated paperstock and the plastic paperclips are not exactly standard fare for German games. However, in my talks with the folks at Pegasus, it does seem like they are trying to produce games which can be fun and very affordable – which is a breath of fresh air in a market where games with MSRP in the 50-70 EUR range are becoming the norm. Chariot Race lists for 20 EUR, and can be found online at Amazon.de for 15 EUR, and other sites for as low as 12 EUR. That is an astonishing low price for a brand new game that isn’t a re-hash of a previous design. Sure, it’s not 3mm punchboard and wooden cubes; but if that set of components takes the price up to 30 or 35 EUR, I’m not sure there’s enough benefit from that increase in MSRP. The game works well with the components in the box, and my game has gotten 5 plays without any sign of damage from that use. It’s a fun game, and as long as the pieces hold up for 10+ plays, I think it’s a great value for the price. Heck, even with non hobby gamers, I’d still bet that most games don’t get 10+ plays. I’m not bothered at all by the bits, as they have worked just fine and they haven’t shown any signs of wear yet – but it is worth mentioning as I know that this is a significant issue for some gamers. From reading the Internet, it does appear that there will be a US version brought here by Eagle-Gryphon. They have a Kickstarter project up now which is really serving more as a pre-order page as they have made it clear that the games were already being printed at the time of the campaign. It seems that this has more to do with getting the games to the consumer in the quickest time possible. For those that are looking to order from abroad, note that the Pegasus Spiele version has English, German, Italian, French and Polish rules included in the box. Joe Huber (12 plays, including 2 with the published game) – You know, I’d noticed before I read his review that Dale wasn’t fond of Chariot Race, and was curious to see why he had such a different reaction from mine. And – it really isn’t; about the only points where we diverge are on our preferences between racing and pummeling, and in our ratings. So, why do I love the game? I suppose it all goes back to Circus Maximus. I played Circus Maximus a number of times growing up, and I wanted to love the game. Chariot Racing! Running into other drivers! Great stuff. Only – the game took forever; I don’t recall ever actually playing a full game, as our tolerance for all of the rules and the frequent runaway leader issues would only hold out for a couple of hours. So when Matt showed me an early prototype of Chariot Race, and it simplified and vastly shortened the game – while still providing for plenty of mayhem – I was sold. Add to this the development of the game – the prototype had some rough edges that were nicely smoothed out in the published game – and it’s a winner in my book. _I_ like the game enough to be happy spending much more on a deluxe edition – but I suspect the price point will help the game garner extra sales, which might even in turn provide incentive for a deluxe edition down the road. In the meanwhile, I’ve had no difficulty enjoying the game as published. Dan Blum: The dice system is clever and makes me want to like the game more. Unfortunately it seems too short for the system to really shine – players have few enough turns that one or two particularly good or bad rolls can be decisive. I also would prefer a more realistic chariot-racing game; actual Roman (or Byzantine) charioteers did not employ caltrops or javelins (or bladed wheels or any of the other silliness available in Circus Maximus, which I have not played).